This is an early example of a B&O record player that uses the original version of the famous B&O magnetic pickup, derivatives of which were used exclusively by the company until thy ceased record player production in the mid 1990s. Text copyright © Beocentral. Unauthorised reproduction prohibited. 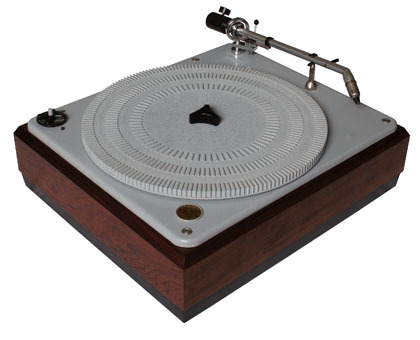 A simple manual model, the turntable started to rotate when the arm was taken from its rest and stopped only when it was replaced. The machine pictured includes an “M-lift” cueing device to assist with the gentle and accurate raising and lowering of the arm, this was not fitted to all models. Text copyright © Beocentral. Unauthorised reproduction prohibited. The four speeds were selected by rotation the knob at the left-rear of the deck in a clockwise direction only. A central control fine-tuned the speed by adjusting a mechanical governor inside. The moulded ribs on the turntable mat served as a stroboscope for accurate adjustment under artificial light. Text copyright © Beocentral. Unauthorised reproduction prohibited. Being the “VF” version this machine included a fully transistorised equalising amplifier that raised the tiny output of the SP2 magnetic pick up to the level typically produced by the crystal and ceramic pickups of the day. A model without the amplifier was also offered, this was known as the “42V”. Models with a smaller turntable were also made, with and without the amplifier unit and were known as the 41VF and 41V respectively. Text copyright © Beocentral. Unauthorised reproduction prohibited. This model changed in 1965 to become the very familiar Beogram 1000. Countless major and minor changes to the basic design were made over the years until the final version, the two-speed Beogram 1001, was finally dropped in the early 1970s. Text copyright © Beocentral. Unauthorised reproduction prohibited.